There’s an old Saturday Night Live skit with Billy Crystal, where he says, “it’s better to look good than to feel good”. Well, although I don’t believe that’s true, it is certainly important to many people to both look good AND feel good, which is definitely possible. And, for many people, part of complete and total happiness includes looking younger as one of the factors. Unfortunately, we are aging faster these days as a society than we should, and even worse (and part of the problem) is that the incidence of several deadly, chronic diseases has increased dramatically over the past several decades. Diseases like cancer, diabetes, heart disease, and even depression are becoming epidemics. Sadly, most people these days just accept these diseases as part of “getting old” and are fine with taking the multitude of drugs used to “treat” these diseases. That is total “BS”! But that’s for another article. 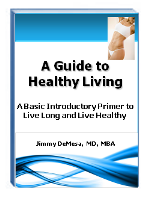 In my ebook, A Guide to Healthy Living, I describe the “solution” to help slow down – or even reverse – the aging process and maintain better health, while eliminating (or at least minimizing) your chances of getting many of the deadly diseases which have become so common in our society today. To the point of “looking younger”, obviously there is a “natural” aging process that occurs in our bodies – which we all go through. The bottom line is that this aging process can be made to occur much more slowly than we are led to believe today – and which we tend to accept as part of "getting older". We also do not have to accept “looking old” as we get into our 40s, 50s, 60s, or even older. Similarly, we must stop accepting disease, chronic medication use, fatigue, and “feeling old” as just part of getting older. We can look younger, feel younger, and “BE younger” well into our 90s and beyond. While it is true that once we get past the age of about 40 or 50, our bodies seem to start aging faster that when we were in our 20s and 30s. Only a piece of this is a natural part of the aging process, but another part of it – a big part – can be avoided (or even reversed). There are specific ways to eat, think, and act that can stop this more-rapid-than-necessary aging process, and even slow it down to the point where you're aging less than a year for every year you “get older”. That means you can look younger at 50 than you did at 40, look younger at 60 than you did at 45, and even look younger at 80 than you did at 60 by taking some relatively simple steps to change the “natural” aging process. Importantly, not only will you look younger, you will feel better, reduce your chances of getting chronic diseases later in life, minimize your chances of having to take prescription medication, and generally make you happier. And, it doesn’t require all sorts of supplements, diet pills, endless hours at the gym, or other common methods out there to “look good”. Also, it works for anyone, male or female, at any age - 35, 45, 55, 65, 75, 85, 95, and beyond. Yes, while looking younger and feeling younger can make us happier, as with many other things in life (like relationships and health) studies show that being happier first, and maintaining a positive, optimistic attitude, help us look younger, feel better, get less diseases, and live longer. That’s the main premise of this whole website – to make you happier so you can have better relationships, enjoy better health, be more fulfilled, and, yes, look younger, feel better, and live longer. So, use this entire site to start your “journey” to a happier life – and help achieve everything you want in the process. You can start by getting a FREE, autographed copy of my foundational book, BeHappy!, just by clicking on the “Order FREE Now” button to the right, and I’ll sign one and send it out to you immediately (just pay shipping). Along with the autographed book, I’ll also send you a FREE copy of both ebooks, BeHappy! at Work, and A Guide to Healthy Living, which you can download right away. Just click on the "Order FREE Now" button above to get all three books free. For the past several decades, the nutritional recommendations we have been getting are to eat a low-fat, low-cholesterol diet and "count calories" to be leaner and healthier. And, definitely avoid “red meat”. And what has that advice done for our bodies? Well, overall, we are much fatter and sicker than we were 50 years ago when we ate higher fat, higher cholesterol diets, including red meat. And, it’s getting worse. By 2030, it is estimated that over 50% of the population will be obese and nearly everyone will be facing diabetes, cancer, heart disease and depression (among other diseases) if we don’t make some changes now! The main issue is misinformation. Unlike what we have been led to believe (and even what I was taught in medical school), cholesterol does not really cause heart disease, low-fat diets do not help make you thinner, and red meat is not bad for you (if it is grass-fed, like it was 50-100 years ago). Rather, inflammation is the main cause of heart disease (as well as probably cancer, depression, auto-immune diseases, and other chronic illnesses). It’s the inflammation that causes cholesterol to stick to our arteries, for example, and our diet is highly inflammatory. So, in simple terms, your cholesterol can be high (and cholesterol is actually needed by the body), but if your inflammation level is low, the cholesterol doesn't stick to your arteries and does only good, not bad. Then, refined sugars – which are prevalent in nearly all our processed foods today – cause inflammation (and ultimately diabetes and cancer). Obviously, it’s not that simple, but it’s one of the main reasons why diabetes is epidemic in our society and is predicted to double over the next 20-30 years and why the incidence of cancer continues to increase, even with all the advances in medicine over the past several decades. The book Anti-Cancer, A New Way of Life calls sugar "fertilizer for cancer". Next, fatty foods help your body in many ways – both related to health and our looks (including weight loss). Yes, fatty foods HELP WITH WEIGHT LOSS. They help reduce inflammation, regenerate certain beneficial hormones, and improve our metabolic activity. That's right – the latest research indicates that "cholesterol" and fat are not bad for us. Our bodies need dietary fat and cholesterol to produce most vital hormones in our body, reduce inflammation, improve our metabolism, and slow down the aging process. It is being determined from more and more scientific research that higher saturated fat, low carbohydrate and low sugar diets are much healthier. Finally, from the "simple" perspective of looking younger, people on low-fat diets just look older and weaker. They get sick more often and are generally not as happy. This is all reversible – regardless of your current age and health, simply by making some changes in your nutritional plan. The bottom line is this: To look younger (and be healthier, with less chance of getting a chronic disease later in life), don’t eat a low-fat diet, don’t focus on calorie-counting or cholesterol intake, and don’t eat refined sugars. Eat a “whole”, non-processed, nutrient-rich food diet. For a more complete explanation of this, click here to get my ebook, A Guide to Healthy Living, for just $1.99. It will open your eyes to some of the false information we have been led to believe over the past several decades which is partly responsible for the significant increase in obesity, heart-disease, diabetes, Alzheimer's Disease, and even depression. 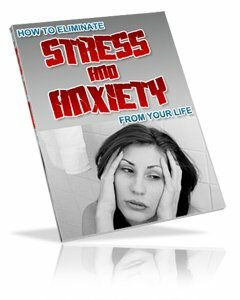 This e-book will change all that and lead you on a path to better health and a longer, happier, medication-free life. 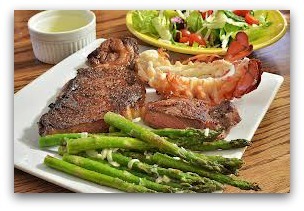 Also, for more of the latest nutritional information, click here for an introduction to the Paleo Nutrition Concept or check out one of the great resources to the right, like The Primal Blueprint and Anti-Cancer, which give some great information on the best way to eat to look younger, be healthier, and live longer. We all know exercise is good for us. There is no doubt about that. In fact, it is essential for being healthy and looking better (and younger). We need to “move more” as a society than we do. The sedentary lifestyle we tend to follow by watching TV, sitting at a desk all day, and even taking elevators instead of stairs is hurting us (and making us age faster). If you don't work out at all, you're going to lose muscle mass year-after-year. That means you'll get fatter and flabbier each and every year – which will make you look and feel older. On the other side of the coin, though, for those of us who exercise - over the past couple of decades, we have been coached to do 45 minutes to an hour of “cardio” exercise, 3-4 times per week and another hour or so of weight training several times per week. Many of the gyms around today have flourished because of this philosophy and many of us have followed this advice. The truth is, however, that much less exercise is necessary for optimal health, fitness, and longevity - and even to look younger. 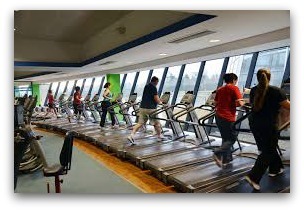 Treadmills, and most forms of endurance training (like running), do very little to help the aging process. In fact, many times, these long-duration exercise regimens can actually accelerate the aging process. This can happen for many reasons. For example, one reason is that prolonged, high-intensity exercise can produce free radicals. These free radicals cause “inflammation” in the body since they can destroy your body's essential nutrients and tissues, which promotes inflammation, aging, and disease. Water isn't just "good for you" — water is essential for health and vitality. Water has many benefits. It helps fight infection, eliminate toxins, boost energy, burn fat, and yes, make us look younger. 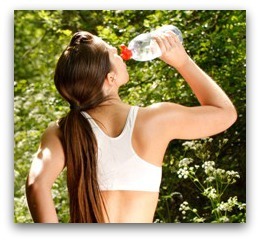 Most people, however, are chronically dehydrated. We just don’t drink enough water. While it is recommended to drink 8 glasses of water every day, even just drinking 12 ounces of water daily can start making you look younger in a matter of weeks. You'll also drop fat, have more energy, and save your kidneys and liver from chronic overwork. When your kidneys are stressed from even mild dehydration, your liver must also work harder to help out. This causes several issues related to both health and looks, including reducing the ability of the liver to help burn fat - which is one of its functions. By drinking plenty of water (again, 8 glasses per day is best) you will be healthier and will soon notice a difference in your level of energy and a more youthful appearance. This is especially true if you drink soft drinks. These "drinks" are highly inflammatory, very toxic, and accelerate aging greatly. Even the "diet sodas" have done a lot to increase the incidence of obesity and disease in our society. So, WATER is the key - not other liquids, especially soft drinks!! Life can be hectic and stressful. There are constant demands on our time and, for many people, this causes stress and anxiety - which in turn accelerates aging and makes us look older. In addition, it is quite common for people who are caught up in all the "necessities" of daily life to get quite "unbalanced". This causes even more stress and anxiety - which accelerates aging further and can cause many serious illnesses over the long-term. Creating Life Balance is a complicated subject, though, and I have written a whole article about it here at BeHappy101.com - so I won't go into it in depth here. 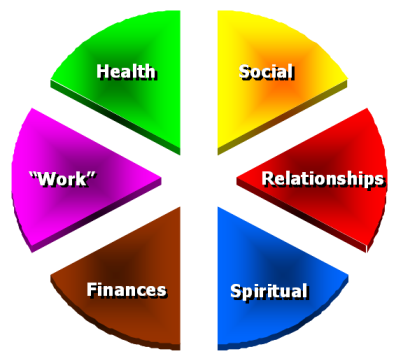 If you need help understanding Life Balance and want to learn more about balancing your life, just click here. The bottom line is that an unbalanced life creates stress and anxiety, which can have many negative health consequences and accelerate aging - making you look older. So, balance your life (and for some people, simplify your life) to be happier, healthier, and younger looking. Take these five steps and it is likely that, within a year, you will look years younger, feel more “alive”, be healthier, and have a much lower chance of getting diseases like cancer, diabetes, heart disease, and even depression later in life.